High temperatures today reached the mid-40s to around 50 degrees around midday. Then winds shifted out of the northwest, providing colder air in association with a disturbance bringing around of snow showers. After snow showers clear out of our area overnight, colder air and calmer weather will take over. A high pressure system (high pressure = calmer weather) currently centered over North Dakota will bring us dry conditions for Saturday. It is also steering in winds out of the northwest, which will create frigid temperatures to start the weekend. We saw some widespread rain last night, and some more scattered rain showers earlier today — with temperatures plunging overnight, any puddles and standing water will turn into ice. Low temperatures tonight will drop to the mid-teens as snow showers leave our area. Mostly cloudy skies are expected tomorrow as temperatures reach only 22 degrees in the afternoon. At least, wind speeds will ease to about 5 mph by the afternoon hours on Saturday. We have a completely dry weekend in store with the high pressure system from North Dakota sliding into the Upper Great Lakes. Mostly cloudy skies are expected tomorrow with highs in the lower 20s. Sunday will start with early-morning lows in the mid-teens, then afternoon highs will warm into the mid-30s under a mix of sun and clouds. The next chance of snow will arrive New Year’s Eve, lasting into New Year’s Day. 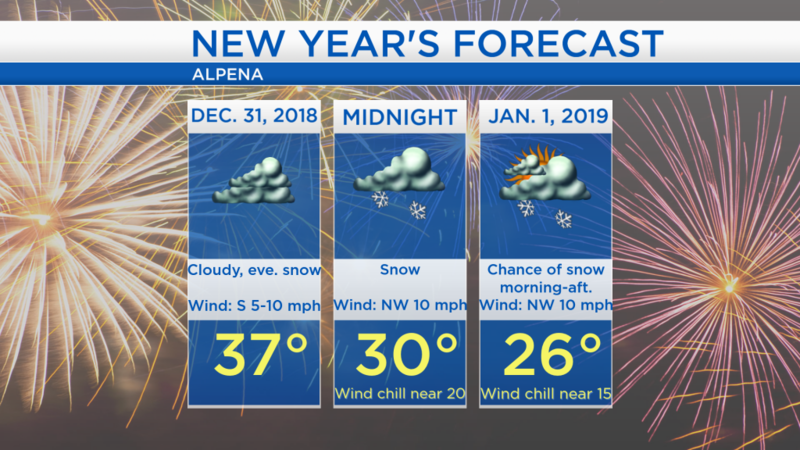 Highs on New Year’s Eve will get into the middle or upper 30s, then colder air is forecast for the start of the New Year with temperatures only in the 20s on New Year’s Day. For the rest of Northeast Michigan’s weather forecast, watch the latest weather video by clicking the weather tab at the top of the page.